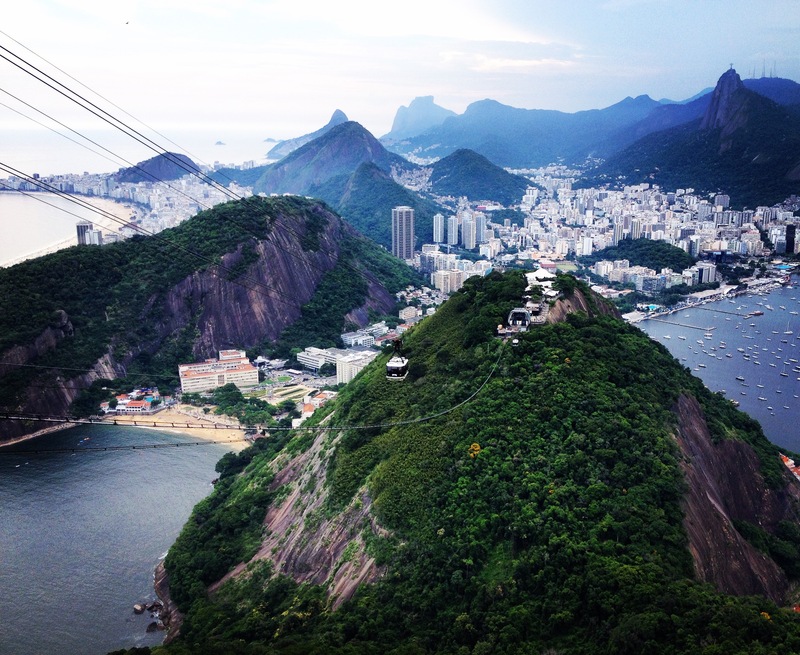 During our three weeks in Rio, we set out to climb Via dos Italianos on Pão de Açúcar (Sugarloaf) four times. My Brazillian friend Cris, who I’d met in Frey the winter before, had given us the local beta to try the route at sunset and then into the night, as the route is directly below the cable car and lit by spotlights from the stations. This sounded too good to be true – especially for the photographer among us – and as it turned out it was, at least during the rainy season. On our third attempt, after being turned around by rain and wet rock the first two attempts, we established a new high point at about 35 meters up the 260 meter face, and as Forest prepared to lead the second pitch, I felt a raindrop on my arm. We looked in the direction of the city and saw a giant dark and advancing cloud, and then turned our wide-eyed gaze at each other, shock and fear covering our faces. We knew how quickly these storms had been moving in. Immediately we began fixing the anchor to rappel, but before I started to descend, less than five minutes after the first rain drop, we were drenched to the bone, pelted by sideways wind and rain, and playing cat and mouse with lightening. It was storm more violent than anything I have experienced in the mountains. Luckily, we weren’t in the mountains, and roughly a half hour later we were wading through knee-deep water in the parking lot below, finding shelter in a café and attempting to wheel and deal with taxi drivers who were requesting four times the normal fare to return us to our neighborhood. Not our smartest outing. On our final day in Rio, we had a score to settle with our Brazilian Meru. Making a last minute decision that felt a bit driven by insanity and desperation to not give up, we started the route around 1:30pm, arrived at the summit around 3:30, and were back at the beach by 5:00 to feel the first raindrop grace our skin. As they say, fourth time’s a charm. You can arrive to Sugarloaf by bus, taxi, bike, motorcycle, or car. Search google maps for Pão de Açúcar from wherever you are, and you’ll see your options. There’s parking available should you need it. The road ends in a round about, and the trail leaves from the farthest end of this round about, heading along the ocean towards Sugarloaf. The hours of this trail are technically 6am to 6pm, but the gate is very easy to hop. From the northern end of the parking lot (closest to Sugarloaf and across from the tram), walk a wide cobblestone path (Claudio Coutinho trail) along the water for about 1/2 mile. On the left you’ll see a very obvious trail upwards, this is the same trail that hikers take to get to Morro de Urca, the first stop of the cable car. Follow this trail until it reaches the ridge, most will go left, but the climbers trail heads right. Total time for the walking approach is 30-45 minutes. The climb begins at the exact point that the trail hits the rock. To your left you’ll see a large roof, to your right is the via feratta, and straight up is a high (20 feet) first bolt to begin Via dos Italianos. Pitch 2: Continue straight up the slight arête, pulling on a few flakes and making a few moves to the left and right to arrive at a double bolt anchor where the angle starts to ease off. You’ll pass one or two other double bolt anchors, positioned at cruxes, I believe. 30 meters, 5.9. Pitch 3: Continue up on more moderate terrain and clip about three bolts before arriving at a multi-bolt anchor at the base of the via ferrata. It is possible to link this pitch with Pitch 2 if you have enough draws. 15 meters, 5.6. You now have two options: Continue up the via ferrata until its end, then pad up a short pitch of slab on which there are many options, ending at the cable car terminal. The second option is joining the classic Segundo route (a 5.11 route but 5.8 and under where it intersects with Via dos Italianos) for 5 more pitches to the top. Unfortunately I cannot comment on this option as we didn’t do it, but was able to find a pretty good route description online here. Take the cable car all the way down (transferring at the Morro de Urca station). Rumor has it that if you show your climbing rope, you can get on the down cable car for free. We did not have luck getting this free climber pass from the mid-station though on one of our bailed attempts, so take this info with a grain of salt. Otherwise, buy tickets before you ascend. The last tram is at 8:40, definitely don’t miss that one.